One thing I’ve learned over the years is that people have strong opinions about the combination of fruit and chocolate. What I’m saying here, is that pretty much the only thing I don’t have uncompromising views on is the combo of fruit and chocolate. Which is when I realized that I might have an intransigent, inflexible, absolutist view of smoothies. I can be labeled as some sort of smoothie fundamentalist. To me, they’re a very specific thing, one or two fruits/veggies, mixed with a liquid (fruit juice or milk), a touch of sweetness, and some add-ons (e.g., chia seed) if desired. 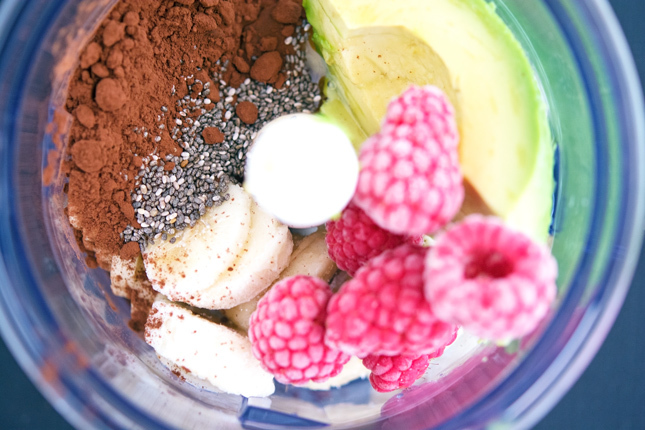 A smoothie with avocado, banana, and raspberries? Cocoa? Honey, chia seeds, milk, and salt? Forget all that: Let’s put a lot of stuff in our smoothies. 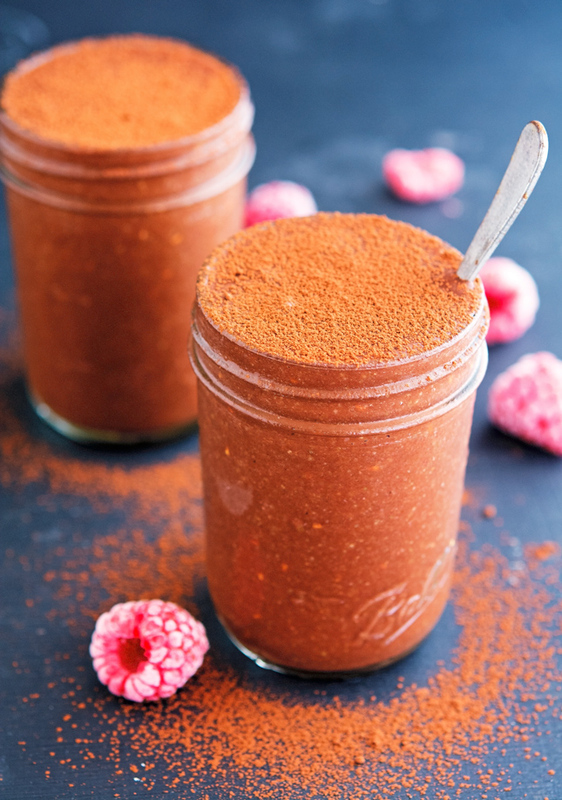 Let’s put cocoa and raspberries in everything. 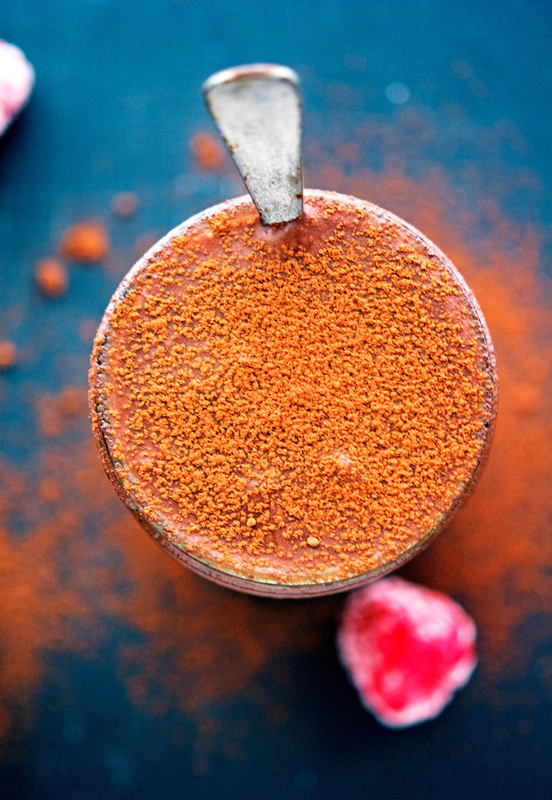 Seriously, can we talk about how good this smoothie is with a tad of dusted cocoa on top? Raspberry and chocolate are one of those combinations that seem like they were meant to be. The sweet tartness of the raspberry compliments the sweetness in chocolate so well. The banana and the avocado give this smoothie a thicker consistency all the while bringing long-lasting energy and healthy nutrients. Guys, this smoothie is a total winner. I think you know what needs to be done. Raspberry Cocoa Smoothie Print this recipe! One serving yields 251 calories, 10 grams of fat, 49 grams of carbs, 5 grams of protein. This has some creamy goodness in here with the banana and avo! Love the cocoa and raspberry flavor combination and especially loving that topping- so pretty! Dusted cocoa Medha, it's all about dusted cocoa! If this is a mess, then I am 100% down for messy smoothie goodness. That avocado and banana? Hello creamy! And raspberry and chocolate? Yes to putting that in ALL the smoothies. Pinned! 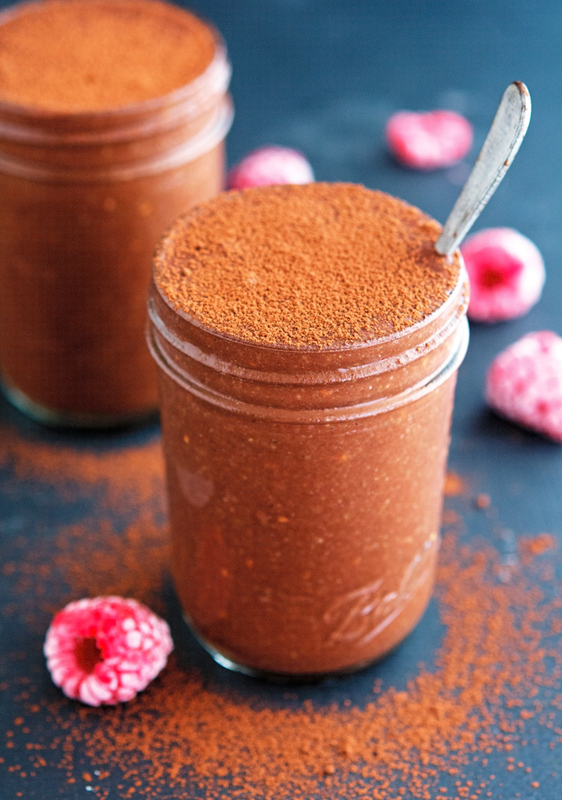 You know what - at times, I've put avocados in smoothies and at times I put in bananas - but never together - and never with cocoa and raspberries (which are awesmazing together) - this might look like a mess - but, it sure does sound delish! You should try this Shashi, it's that good! I love the colour of this. It looks delicious. Hi Mike, this might be a mess but it sound delicious, love the picture of each item but all together in the glass. Have a great week-end! I'm taking your word on this one & giving it a go! It sounds strange but looks amazing!! It really is amazing Senika, you should totally give it a try! Ahhh the avocado - adds a nice creamy touch!! I love the choco/rasp combo. Happy Friday!! Absolutely agree, Mike - the combo of fruit and chocolate is legit. I love incorporating cacao in my green smoothies. It lifts them up to a new level. Love your smoothie collection and their pictures (I've haven't been able to get any decent pictures of that chocolate green smoothie yet). Choco green smoothie, I like the sound of that! Be right back. Going to make this NOW! Chocolate and raspberry is the best, and I can't wait to make this for breakfast! I know right? Such an awesome combo!